The most critical component in your performance boat is your steering. Your steering is critical to safety, performance and usability. Having a bad or insufficient steering system can be outright dangerous in a performance boat. Imagine the torque on your steering at any speed above 60 MPH or 80 MPH and now imagine it just letting go. It would be catastrophic. When balancing a boat on its pad or guiding a deep V through some cross waves, your steering input and feel is so important. This article is to provide an overview of some of the hardware on the market that can help you stay safe on the water and get the most out of your setup. Mention of specific products is not necessarily an endorsement, because applications can be unique, seek consultation from manufacturers for advice on your system. This is specific to outboards only. At one time, not long ago, I would probably talk more about cable steering but now, it is only in certain circumstances I would recommend a dual cable setup. Dual cable steering is great, cost effective and is excellent for feel and input but today’s hydraulic systems are excellent and make the driving experience far superior. The early front mount hydraulic systems were not as precise and weren’t designed for big outboards running high on the transom but that’s not the case anymore. But for small performance boats with less than 150 HP or “old school” guys, a dual cable system can be an option. A UFlex USA, Silversteer high performance front mount steering cylinder. Another factor that greatly affects steering is your engine mounts. A great steering setup can be compromised by soft “rubber” mounts. Typically, motor mounts come in a few different forms: rubber (soft mounts), polyurethane (semi-solid), dicor (solid) and solid metal mounts. You want solid mounts when you are serious about performance and upgrading your steering. Most outboards come with rubber mounts, unless they are specific performance outboards which have either semi-solid or solid mounts. Rubber mounts have too much play and will wear out eventually. Solid mounts have no play, which means they will experience the vibration of the engine but provide the most precise steering and feel; they are very robust and will last a very long. Your engine is mounted on a mounting bracket and the engine turns on a swivel, as part of the bracket. 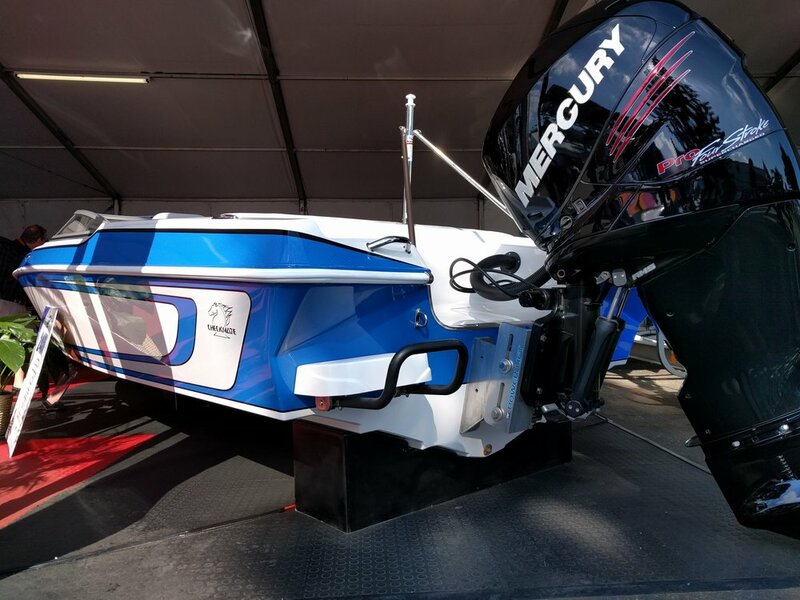 Most outboards are controlled by a steering arm at the front of the engine, providing the proper leverage and balance to turn the engine on the swivel; whether it is hydraulic or cable. 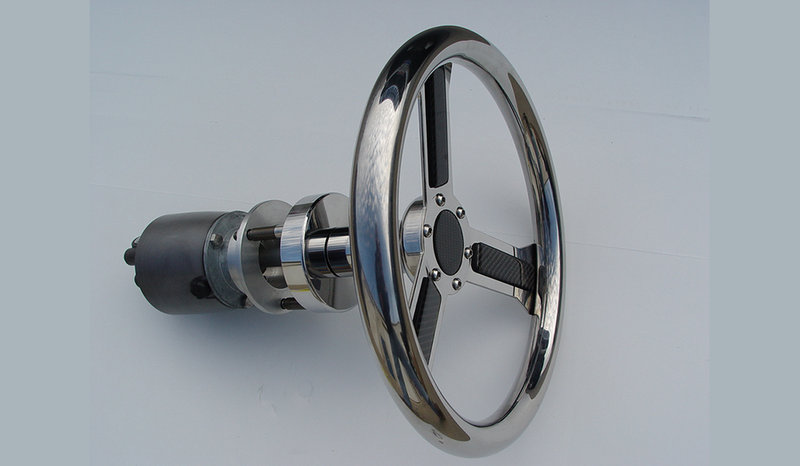 Torque from the propeller is transferred straight through the swivel, the steering system and to the wheel in your hand. For the most robust systems, an external side mounted steering arm is attached to a plate off the back of the engine, providing stability for extreme performance conditions. Multiple engines can be tied together with a specific mounting plate as well. Twin 400 R Verados with a tie bar to keep them parallel and evenly distribute loading. There are a few manufacturers making front mount hydraulic steering systems designed for performance boats. The main differences of performance systems are the helm, the lines, the cylinder and the robustness of the system in that it has less slop than a “non-performance” version. Performance versions may use kevlar lines, stainless steel shafts, heavy duty seals etc. The drawback of early systems was the play in the steering but newer high performance versions have almost no play in the system and are designed for big outboards running high on the transom. This is important for controlling the boat at high speed by providing consistent input. If you buy the complete system, it will consist of your helm pump, hoses, fittings, hydraulic oil and cylinder. Some helms are interchangeable, check with the manufacturer. SeaStar, Latham and Uflex USA are the most popular systems. The SeaStar Pro system calls for a specific helm and using SeaStar kevlar lines. The Uflex system advertises it can be used with competing helms. If you’re starting fresh, both offer complete kits for a good value and they are easy to install. Once you install your new steering you will see what all the hoopla is about, you can steer with one hand, no steering torque and it’s very precise. For more extreme performance applications, racing and otherwise, you may want to consider a side mount steering system. They can be very robust by allowing for larger cylinders, solid side mount pins that replace hollow tilt tubes and solid steel clevis joints that attach to solid plates attached to the back of the engine. They can be used with different helms and are more of a “custom” system but most manufacturers offer everything you need to build a kit. 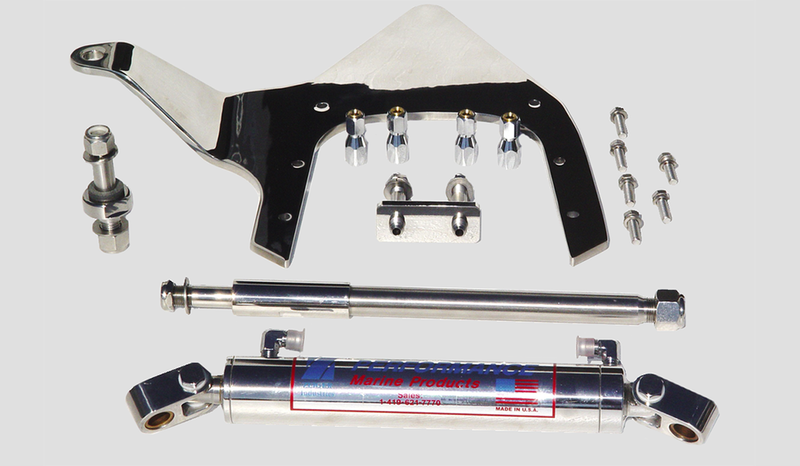 A Zeiger side mount steering kit. Leading manufacturers include, Imco, Latham and Zeiger by Everett Performance. All have many options for different applications, from tie bars and mounting plates to cylinders. Every engine is different, some require minor adjustments to the cowling for the rear mounting plate to fit. They have helms, steering wheels and everything to build your system. Some helms require a balanced cylinder, some don’t, so check your specific application. Side mounted steering can be very robust and provide more stability. Side mounted steering leverages the steering by attaching to the back of the engine with a bracket. Some minor things to keep in mind are if you’re switching to a hydraulic system, your steering wheel will not always be true center. So if you have trim and other controls mounted to your wheel, you may want to switch to lever style ones or mount them elsewhere. Also, routine maintenance is required; like cleaning and greasing the steering tube, the support rod and greasing the support bracket contact points. Always inspect your system. A beautiful custom wheel from Zeiger, if you're getting a new system, why not get a wheel too. 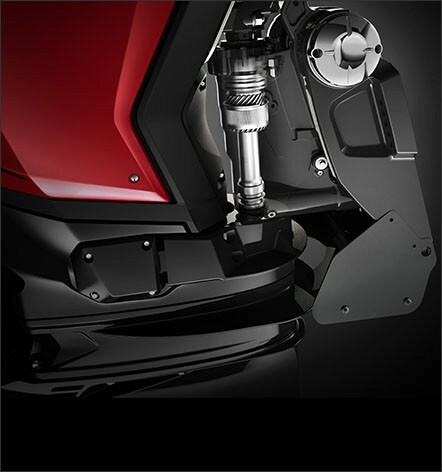 New engines from Evinrude, the G2, feature a hydraulic steering system built right into the swivel bracket. This holds many advantages, one being that it is basically invisible and all of the rigging connects through one tube. The rigging tube remains stationary along with the bracket, making this the cleanest rigging possible. It’s beautiful actually. Look for other manufacturers to do this on their next generation engines. Evinrude G2 Steering integrated right in the swivel bracket. Integrated steering allows for a single rigging tube and a super clean look. The Mercury Verado was early with integrated steering, a front mounted hydraulic unit built into the bracket.